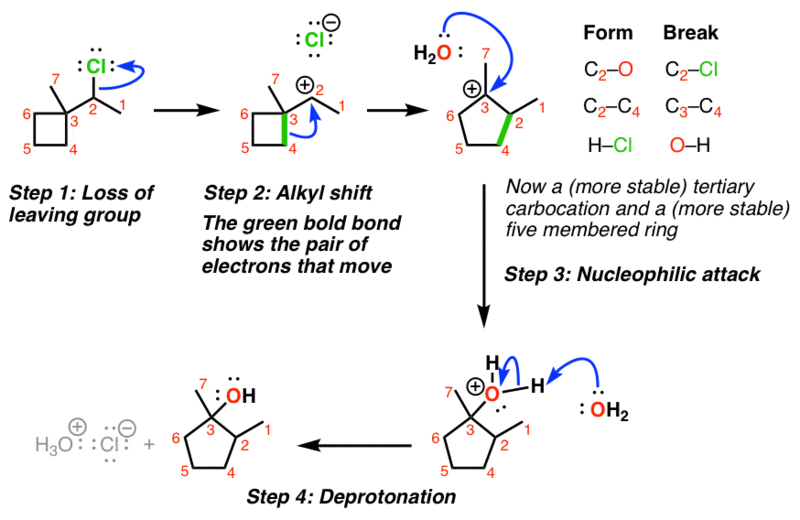 In the last post we saw how certain carbocations can sometimes rearrange (through hydride shifts) to give more stable carbocations. However, sometimes there are situations where a hydride shift would not lead to a more stable carbocation, such as in the case below. If a hydride shift occurred here, we’d be going to a less stable (primary) carbocation! You might note something with this example, however: it is possible for a more stable tertiary carbocation to be formed. The most common situation where alkyl shifts can occur is when a quaternary carbon (that’s a carbon attached to 4 carbons) is adjacent to a secondary carbocation. How does this work? First, the pair of electrons from the C-C bond must align with the empty p orbital on the carbocation (side note: this means they have to be aligned in the same plane). Then, as the pair of electrons from the C–C bond is donated into the empty p-orbital, one C–C bond begins to break and the new C–C bond begins to form. Rearrangements can potentially occur any time a carbocation is formed. That includes SN1 reactions (and as we’ll later see, elimination and addition reactions). Here’s an example of an SN1 with an alkyl shift (note that the CH3 groups here are just shown as lines). It doesn’t always have to be a methyl group that moves! One interesting example is when a carbocation is formed adjacent to a strained ring, such as a cyclobutane. Even though the CH3 could potentially migrate in this case, it’s more favorable to shift one of the alkyl groups in the ring, which leads to ring expansion and the formation of a less strained, five-membered ring. Here’s an example of an SN1 where an alkyl shift leads to ring expansion. Having gone through two types of rearrangements in substitution reactions, the next series of posts will cover a different class of reactions: elimination reactions. It was an error. Thanks for correcting me Krishnan. I think in the very last reaction the attack by the water is shown at a wrong place. no, i think it’s correct. When you expand you realize that the C that shifted is satisfied with 4 bonds C-H, C-CH2, C-CH3, C-C+. Whereas the C to which OH later gets attached has only 3 bonds C-CH2, C-CH3 and C-CH. Moreover if the OH had attached to the C you think it should’ve, it wouldn’t have enough free valence e- to another atom. Both reduction amd rearrangement occur in reaction…??? Replacing Cl with OH is not a reduction. Both are more electronegative than carbon. The 1,2-hydride shift occurs because of the hydrogen atom moving to the adjacent carbon with both of the electrons in the bond, according to what my teacher explained. He said that even alkyl groups can shift (though alkyls are much larger than hydrogen) since only the electron cloud is actually shifting. Is it then possible to have any other shift that stabilizes the carbocation intermediate in a reaction, e.g. a -OH shift? You mentioned “allowed” rearrangement reactions, so what reactions are disallowed and why? How would you explain the methyl and ethyl carboxylate groups attached to the same carbon and only the ester group migrates as the 1,2 shift? Is the migration via a radical or to the carbanion? I do not think that to the carbocation center. You said there are no 1,2-shifts in radicals. It would help to see the specific example you’re thinking of, but it wouldn’t be a radical shift. There are two lone pairs on oxygen that could come down to help stabilize any positive charge buildup on the carbonyl carbon during the shift. Please explain why the reaction of neopentane yields 1- chloro- 2,2-dimethyl propane when treated with chlorine molecule during free radical mechanism ? why not 1,2 methyl shift to give more stable tertiary free radical as compared to less stable primary free radicle???? 1,2-shifts do not occur with radical substrates. Only carbocations. is it necessary that such shifts occur only from the carbon atom adjacent to the positive charge?? Why rearrangement doesn’t occur at 1 butylcarbocation. If occurs what is the product when 1butene reacts with Hcl? Once the tertiary carbocation forms, no rearrangement can occur that will make it more stable. Why does the alkyl shift cause C2-C4 bond and not C2-C7? Hi! 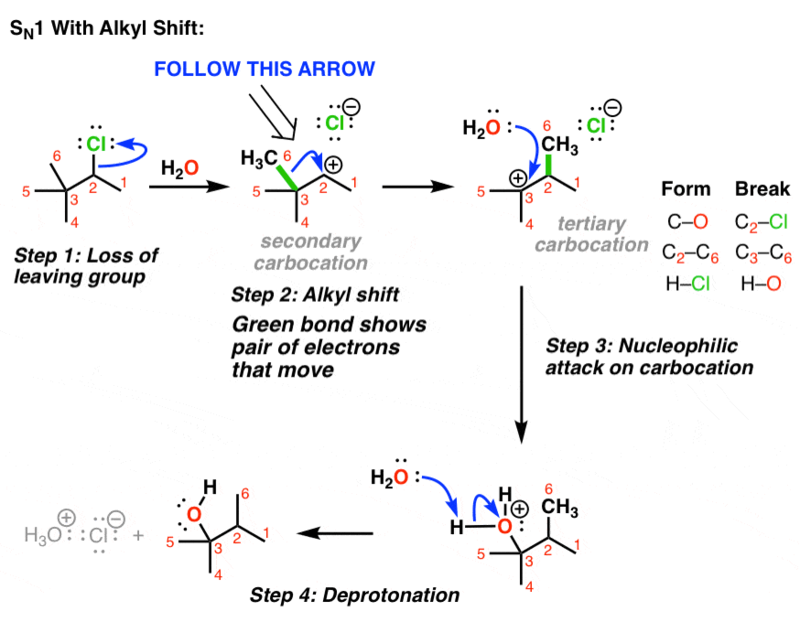 Why did another water molecule appear in the first example of a alkyl shift? I thought you already attached one molecule to the carbocation. Shouldn’t the “leftovers” be H+Cl-? I understand the extra hydrogen makes the other water molecule turn into hydronium ion but where did the other water come in the first place? Is this a water characteristic in reactions? This would be with water as solvent (an ionizing solvent). Without the water, no substitution reaction would occur. Good question. Ethyl (and other primary carbons) will migrate preferentially over methyl. If suppose during ring expansion, in the figure you have uploaded we have an oxygen atom at 4th position.Then which of the following bonds C3-C6 or C3-O4 will be broken for ring expansion? What you are describing is the ring expansion of an oxetane into a tetrahydrofuran derivative. I would expect the C-C bond should migrate with simultaneous formation of an intermediate C=O pi bond. This would be a variant of the pinacol rearrangement.